Today's manufacturers use the latest innovations in high technology to duplicate the warmth and beauty of natural wood and stone while at the same time offering durability against wear, stains and fading. These affordable laminates are a great alternative to their more costly natural counterparts. 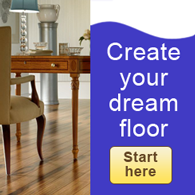 Laminate flooring has a layered construction and is comprised of four layers. The Wear layer is an easy-to-clean surface that contains aluminum oxide which protects the floor from stains, fading and wear. The Image Design layer is a photographic image of wood, stone, or virtually anything you can imagine. This is followed by the Inner Core layer, which provides the floor's structural strength and stability. It is made from high-density fiberboard. The core is often impregnated with a plastic resin called melamine to increase the floor's strength, stability and resistance to moisture. Finally, the Backing layer creates a moisture barrier that protects the floor from warping and is made with resin saturated paper. The quality of the design and embossing figure prominently in the price of laminate. Trust your eyes to choose a laminate that looks and feels realistic. FloorWerks carries a wide selection of some of the most innovative laminate products on the market today. Our favorite collections include laminates by Armstrong, Bruce, Krause Floors and Berry Floors. Browse through our flooring gallery to get design ideas. Then contact us and let us turn those ideas into reality!